Photographer Kevin Bolton took a great shot of a greater yellowlegs at Mill Creek Marsh in Secaucus this week. A link to the photo is here. A link to his blog is here. Kevin posts a lot of great shots from the Meadowlands. 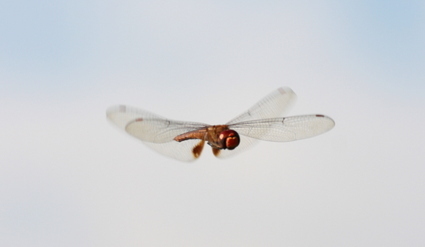 The Meadowlands are abuzz with dragonflies these days. 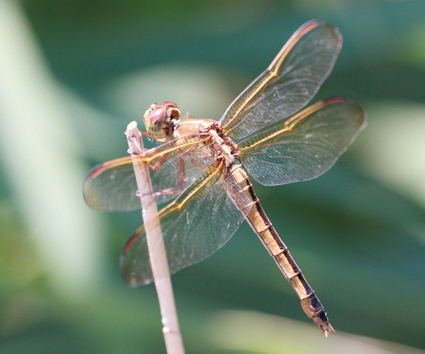 Needham's Skimmers are among the zillion dragonflies and damselflies zipping around. We could never get one of these guys to sit still long enough to photograph it, but this male hovered enough for us get him in mid-air in DeKorte Park, Lyndhurst (above). A female Needham's Skimmer is below. The photos included here were taken in Carlstadt, Little Ferry and Lyndhurst and North Arlington. Click "continue reading …" below for more dragonfly shots. This blog was officially announced last week, but it began more than a month ago with this video of groundhogs. We got the video by walking past a groundhog den that we knew was occupied, placed a small videocam on a tripod aimed at the opening, hit "RECORD," and walked away. We came back 10 minutes later, reviewed the footage, and edited down to this short video. In case you missed it, here it is again, using a "green" on-line equivalent of YouTube. As you enter the Marsh Discovery Trail at DeKorte Park in Lyndhurst, you’ll see a tree with large leaves and strange green pods. And you may well wonder what it is. "This is a Paulownia tomentosa: princesstree or Royal empress tree," says NJMC horticulturist Ian McDermott. 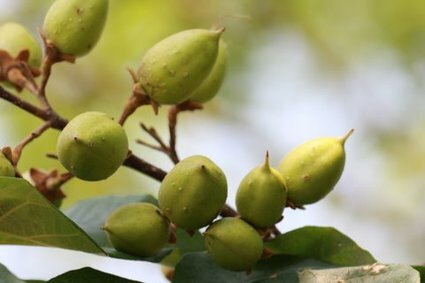 "This tree has purple sweet smelling flowers in late May and June. Sticky seed pods." 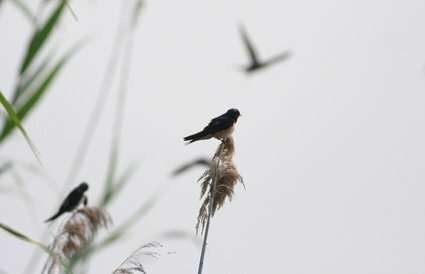 The tree swallows in the Meadowlands have been getting more publicity, but the barn swallows are making their presence known as well in DeKorte Park. Walk in the parking lot and they’ll be whizzing past. Walk on the Marsh Discovery Trail or on the elevated boardwalk near the Environment Center, and they are zipping past everywhere. 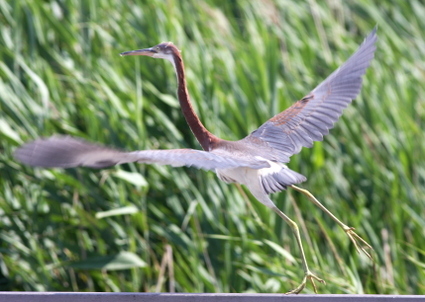 In fact, they zip so fast they are next to impossible to photograph in flight. 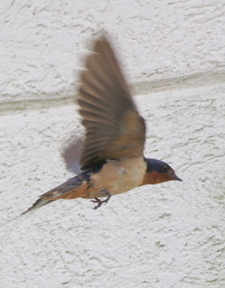 Click "Continue Reading" below for more on barn swallows and a photo of an empty nest. We shot this heron video Friday and edited over the weekend. The video should be played with the volume on. 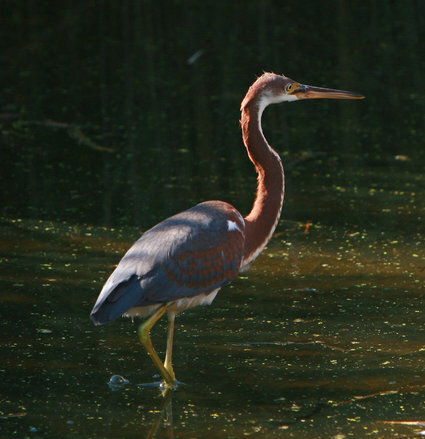 We did not see the tricolored heron on Monday morning. Photo below was taken by James Kuehlke on Friday. Previous posts on the tricolored heron are here and here. 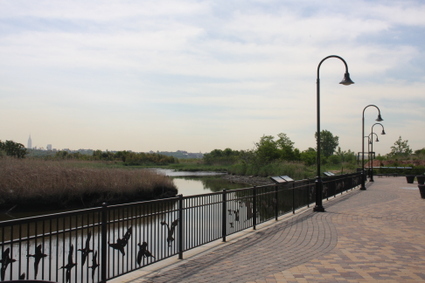 On its Web site, the Meadowlands Commission just posted an informative video on its many trails and greenways. Click here, then click on "NJMC video clip" to view. 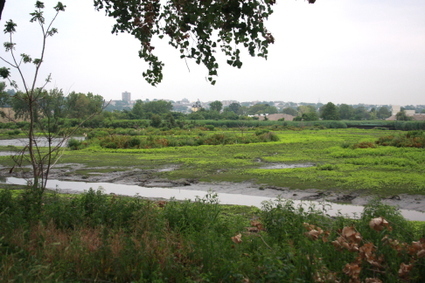 Update: Heron was still here toward the beginning of the Marsh Discovery Trail as of 4 p.m. Friday. He was near the second structure on the right as you walk in. Fabulous looks at the bird. The tide gate is opening at the impoundment soon, and the water level will drop — no guarantee the tricolored will stay much longer. We are told the bird was first seen at DeKorte on Tuesday. If you have a significant sighting in the Meadowlands, please e-mail Jim Wright. I hope to post a video on Monday. We were walking along the Marsh Discovery Trail around 3:30 p.m. Thursday when we saw this amazing (and very small) heron walking in front of us. The juvenile tricolored was not skittish at all, and as a family neared him as they walked along the boardwalk, he hoped in the water by the boardwalk, then perched on a handrail (above), then flew. Click "Continue reading" to see more shots.